If you're looking to understand the essentials behind a successful healthcare simulation center management solution (specifically audiovisual recording and playback for enhanced debriefing), you've come to the right place. Audiovisual debriefing makes simulation-based education relevant and more meaningful. Acquiring the best equipment for this pivotal component of center management is crucial because debrief supports critical principles of training that lead to deep learning. These include immediacy, reliability, time, and adaptability. It's important to debrief as soon as possible after simulation training. Learners tend to respond with relevant insight and honest self-assessment when a debrief is conducted while the simulation experience is still fresh in their minds. Center management technology must be of the highest quality to obtain the most reliable results. A perfect audiovisual system is one that is not only expandable and scalable, but also gives the facilitator enough confidence to concentrate on education without having to worry about insufficient resources or equipment failure. An appropriate amount of time should be allotted for effective and efficient debriefing. Short-cutting a simulation debrief may rob students (and facilitators) of valuable opportunity to reflect, recollect, review and learn. Debriefing requires adequate time and expert guidance to succeed. Simulation training that utilizes audiovisual capture ought to permit access to the simulation content where and when convenient. Students and healthcare trainees possess a range of diverse learning styles and study strategies. Facilitators often require access to training materials from various locations to suit their individual schedules. An ideal center management solution is one with the adaptability to respond to these needs and conditions. LearningSpace is the complete, fully-scalable audiovisual learning solution that combines power with simplicity in a truly user-friendly fashion to give your simulation programs the most comprehensive management system available. 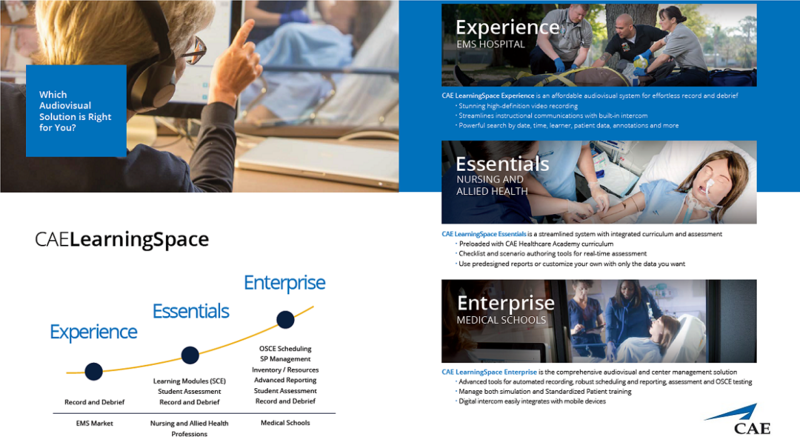 From one-room, bedside, and in situ training, to multi-site simulation center management systems, with tiered platforms to suit your center's specific needs, CAE LearningSpace helps you to better manage your healthcare training environment so that you may successfully achieve your learning objectives.